It was a tough road but you are a Cancer Survivor. Share your story, so that you can create additional Ovarian Cancer Awareness, by wearing your own Cancer Survivor Personalized T-Shirts. This is a beautiful gift for your Mom, Grandma, Sister or Best Friend. Our Ovarian Cancer Awareness Personalized Shirt is available on our premium white 100% cotton T-Shirt, machine washable in adult sizes S-3XL. Also available on Ash Gray. Includes FREE Personalization! 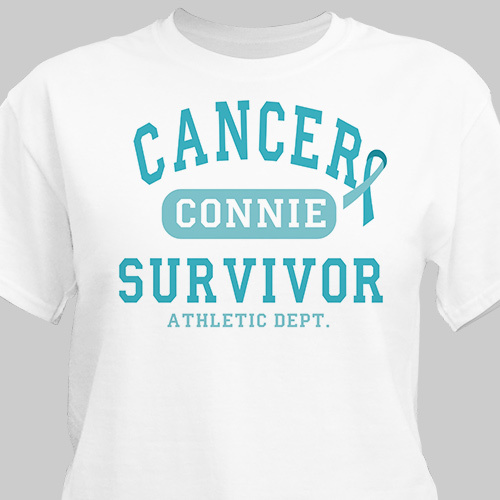 Personalized your Cancer Survivor Shirt with any name.